What’s the point of having a house of the future if your family members, roommates, or guests can’t take advantage of all its features? Share the future-is-now vibe by allowing their iCloud account to control your smart lights, thermostat, and more. HomeKit is the framework that links together all of the diverse HomeKit accessories in the growing stable of Apple-approved smarthome products. If you’ve upgraded parts of your home to take advantage of HomeKit-enabled accessories like smart bulbs, a smart thermostat, smart locks, or the like, then it’s only natural you’d want family members, roommates, or guests to get full use out of them too. By default, however, the only person who can control all the HomeKit accessories is the person who set the system up; the administrative control is linked to their iCloud login. As such, if you want to grant access to anyone else in your home, you’ll need to invite them and authorize their iCloud account. 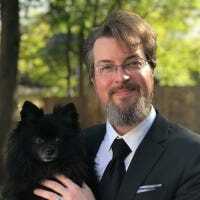 The process of both adding and removing guest users is, thankfully, quite simple if you know where to look. Once you’ve authorized their iCloud account they can use apps and Siri to control your home’s smart devices just like you can, issuing commands like “Hey Siri, set the thermostat to 72 degrees.”, “Set the scene to movie night”, or using any other commands or apps your accessories support. If you’re here because you’ve previously used HomeKit and shared your HomeKit system but everything seems out of place, don’t worry–you’re not losing your mind. Between iOS 9 and iOS 10, Apple moved the majority of HomeKit settings from iOS’ Settings menu into the brand new Home application. Before we jump into the actual setup process, take a moment to ensure that you have everything ready to go. 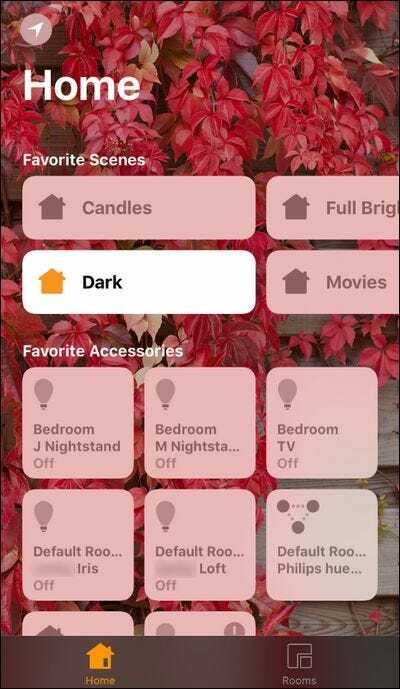 You’ll need at least one installed and configured HomeKit accessory (if you’re in the shopping mood, we can’t say enough good things about the new HomeKit-compatible Philips Hue system). Other than that, you’ll need the iCloud ID of the person you wish to add, and they’ll need an iPhone or iPad running iOS 10. In addition, if they want more granular control over the smarthome accessories, they’ll need copies of all the relevant apps used to control them (like the Philips Hue app, to stick with our example). We’ll touch on that more in the section “How Guests Can Use Your HomeKit House” below. Finally, the only real hiccup you’re likely to run into is if you’ve accidentally set someone else up as the administrator (e.g. you set up your HomeKit gear on your kid’s iPad and now it is linked to their iCloud account). In such instances, you’ll need to reset your HomeKit configuration and reconfigure it from your device so you’re the administrator. Once you’ve checked off the list in the previous section, adding someone to your HomeKit system is easy. For the sake of brevity and clarity from this point forward, we’ll refer to any person you are adding to your HomeKit system as a guest user. 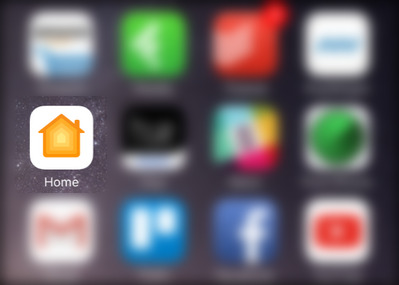 Grab an iOS device logged into the HomeKit administrator’s iCloud account and open up the Home app. Inside the Home app, tap on the small arrow icon in the upper left corner of the screen to access your HomeKit settings. If you only have one HomeKit home, you’ll be in the default “Home” view (or whatever you named your house). 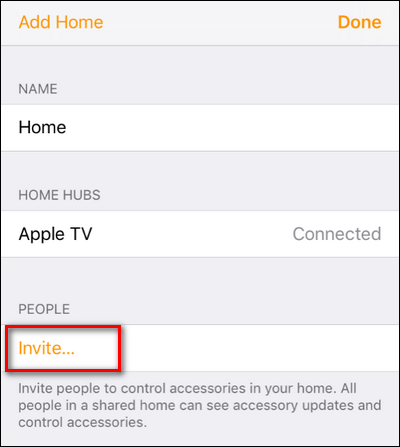 If you have multiple HomeKit-enabled homes, take a moment to select the one you wish to share access to. Once you’re looking at the correct home, look for the “People” entry and select “Invite”. 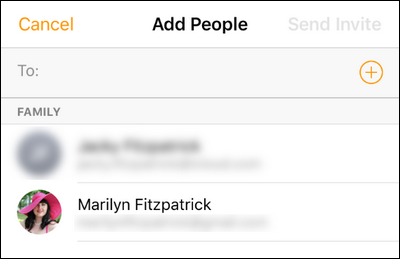 In the following “Add People” screen, you’ll be able to browse your contact list, manually enter an email address, or, as seen below, conveniently pick from people that are already a member of your Apple Family Sharing plan. Select as many people as you wish (you can invite more than one person at once) and then select “Send Invite” in the upper right corner. Back on the main home settings page, you’ll see your pending invitation. There are a few minor settings we need to tweak for our invited users, but they need to accept their invitation before we can toggle them. Let’s look at that step now. On the guest user’s iOS device, they will receive a notification alerting them to the invitation. Don’t worry if they miss the notification, they can just as easily open the Home app and tap on the same Settings icon that we used to send the invitation in the first place. Once they click on the notification or on the settings icon, they’ll be prompted to accept the invitation. 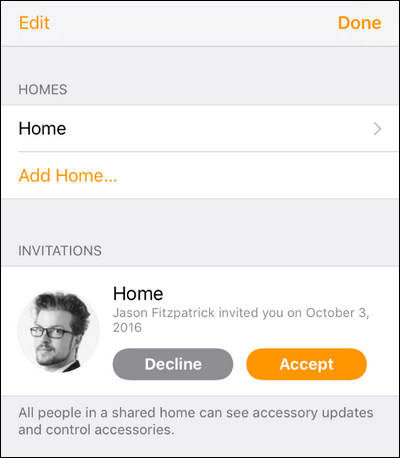 Once the invitation is accepted, the user has full access to the shared HomeKit home. Before we dive into using the HomeKit home as a guest though, there’s a little bit of tidying in order. There’s a small quirk that your guest users will surely immediately notice. 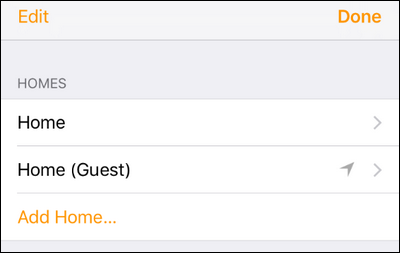 All iOS 10 devices have a default “Home” set in the Home app–even if the user has never used HomeKit before and signing on as a guest in your home is their first and only experience. This can lead to confusion because they will then have two entries for “Home”: their default “Home” and then the “Home (Guest)” for your home (or whatever you’ve named your home, like “Brentwood (Guest)”. Further, the Home app wants to default to what it thinks is your “real” HomeKit house, which means your guest users will find themselves frequently switching from the phantom default “Home” to the Home they’re a guest in. Obviously, if your guest user is a temporary house guest who actually has their own HomeKit home to return to, don’t mess around with their settings or suggest they delete anything. If your “guests”, however, are your spouse and kids who live in your home full time, then it makes sense to tidy up. In the Settings menu of the guest user’s device, head to “Homes” and then select the entry for the phantom default “Home”. After selecting it, scroll to the bottom and tap “Remove Home”. The simple act of purging the phantom home will make life much easier for your more permanent guest users. HomeKit functionality has, thankfully, come a long way since it was introduced, and the changes in iOS 10 make HomeKit more user-friendly for everyone–especially guests. Historically, you had to download every smarthome application for your smarthome gear and install it on the guest user’s phone. This meant if you used the Philips Hue app to control the lights, then they needed to do the same (along with every other smarthome app you used). While they can still do so if they wish, they don’t need to. Now, every iOS 10 device comes with the Home app, which can function as an all-in-one smarthome dashboard. Even if the guest user hasn’t installed any of the same smarthome apps you’re using, they can still access the dashboard to toggle on and off devices, trigger scenes (that you, the HomeKit administrator created), and otherwise interact with the HomeKit home the way you do. Simple, huh? In most cases, such as granting access to a spouse or child, you likely won’t ever need to revoke someone’s access. But you may wish to restrict it so they can’t edit the HomeKit system. In addition, you may wish to restrict remote access in the case of house guests (why would they need to control your home when they aren’t there?) or remove them entirely when they leave. You can do all this by returning the screen where you originally invited them (by opening the Home app, tapping on the settings arrow, and looking at your “People” list) and selecting them. 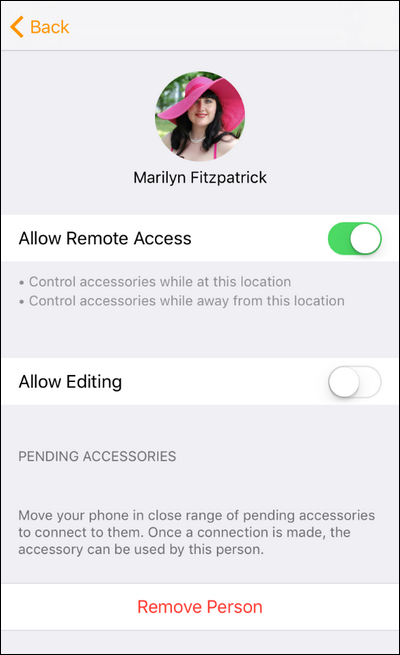 There you can toggle remote access on and off (you, of course, need remote access enabled for the whole HomeKit system for this to work), toggle editing on and off (which allows the user to edit the names of your HomeKit accessories, the rooms, and other HomeKit settings), and finally you can remove the person from your HomeKit system altogether. 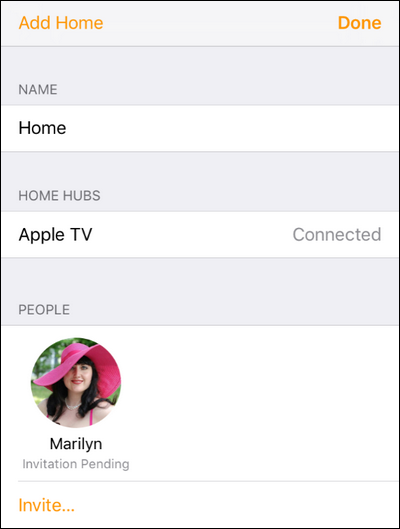 That’s all there is to it: with trip into the HomeKit settings and some basic application setup on your guest’s iOS device you can share your awesome home-of-the-future gear with everyone in your household.